The Rangers fell short of the Flyers, ending their 10 game point streak, but losing just their second game in regulation this month. Photo courtesy of Getty Images. It seems that the trade rumors may have rattled the Rangers (38-17-6), looking flat at times and dropping their first game to the Philadelphia Flyers (27-25-11), ending their 10 game point streak as well as their four game win streak. The Rangers were looking to set a new franchise record for wins in the month of February, but fell a win short, finishing the month with a 10-2-2 record. The Islanders also lost to the Hurricanes today, so the Rangers remain just two points behind the Isles with three games in hand. It wasn’t the best effort from the Rangers. They got a lot of pressure on Mason late in the third period, but it wasn’t enough, as Mason stood on his head for the Flyers, stopping all 16 shots that he faced in the final period. His counterpart, Cam Talbot, actually played a really great game. Talbot was the only reason that the Rangers were in the game after the first two periods, and pulled out a bunch of great stops. Talbot would finish with 30 saves, but could not come away with the win. Cam Talbot was great, but his team did not perform great in front of him, and could not come away with a win. Photo courtesy of Getty Images. The game got off to a crazy start, when it appeared that Derek Stepan has scored from center ice due to a bouncing puck. However the referees came together, and made the correct call that a Ranger was offsides, and taking the goal off of the board. After some back-and-forth play, the Flyers broke through first about halfway through the period. Dan Boyle tried to send a shot through Matt Read, but that obviously didn’t work. Read went on a breakaway, and Boyle lost his stick trying to keep up. After some nifty passing, the first shot was stopped, but Read knocked the puck out of midair, quickly transferring it to his forehand and beating Talbot short side for the first goal of the game. The Rangers wasted no time answering back, scoring just 24 seconds later. It was JT Miller getting the monkey off of his back, scoring his sixth goal of the season, and his first since December 29th against the Dallas Stars. The Rangers third line was forechecking, and Hagelin intercepted the puck, passing it off to Miller heading to the net. Miller’s wrister was stopped, but he followed up on the shot, backhanding the puck past Mason and tying the game at one. JT Miller had a fantastic game, scoring the opening goal and wreaking havoc the entire night on the third line. Photo courtesy of MSG Photos. Talbot made some big saves this period, including one on Claude Giroux firing from point blank after a defensive giveaway. The Rangers were a bit sloppy in this period, and the giveaways were noticeable. His strong play carried over to the second period, stopping Raffl and following that up with a glove save on Giroux. Later in the period, it was the Ivy League line consisting of Tanner Glass, Dominic Moore, and Lee Stempniak getting to work on the forecheck, and John Moore blasted a power play shot that deflected off of the skate of a Flyers defenseman and past mason, giving John Moore his first goal of the season. The assists went to Tanner Glass and Dominic Moore. 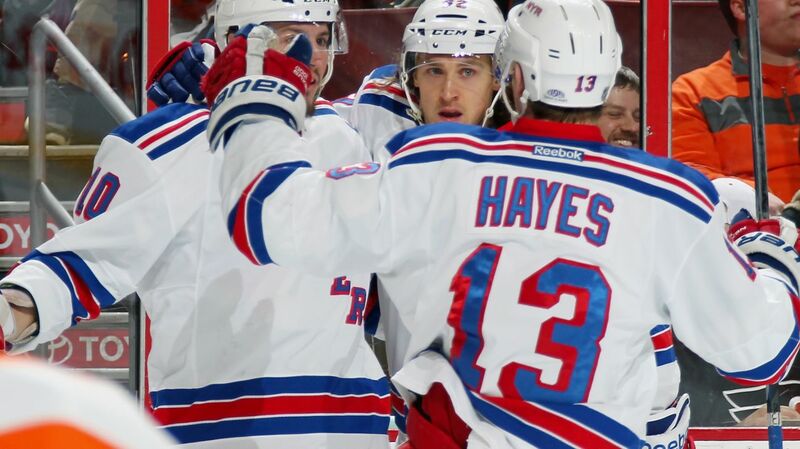 John Moore celebrates with Kevin Klein and Tanner Glass after scoring his first goal of the season. Photo courtesy of Getty Images. This time it was the Flyers answering back quickly after a power play expired. Michael Raffl scored on a deflection, tipping the puck past Talbot to tie the game at two goals apiece. The score would remain at that heading into the third period. Right off the bat, just 1:19 into the period, former Ranger Michael Del Zotto scored the shorthanded, go-ahead goal for Philadelphia. Shawn Couturier got the puck at the blue line, and handed it off to Del Zotto, firing a wrist shot top shelf past Talbot and giving the lead to the Flyers. The rest of the period was a lot of chip-and-chase style gameplay, with the Flyers effectively limiting the Rangers speed through the neutral zone. The Rangers best chance to tie the game came late in the period, firing a flurry of shots at Mason. He first stopped Dan Boyle’s slap shot, and denied Mats Zuccarello on the rebound. He then stopped another Zuccarello wrist shot up high, and kicked out the right pad on Rick Nash, ending an unbelievable spree of and keeping the Flyers ahead. Wayne Simmonds would add an empty netter with .3 seconds left to seal the win for the Flyers, their first against the Rangers this season. 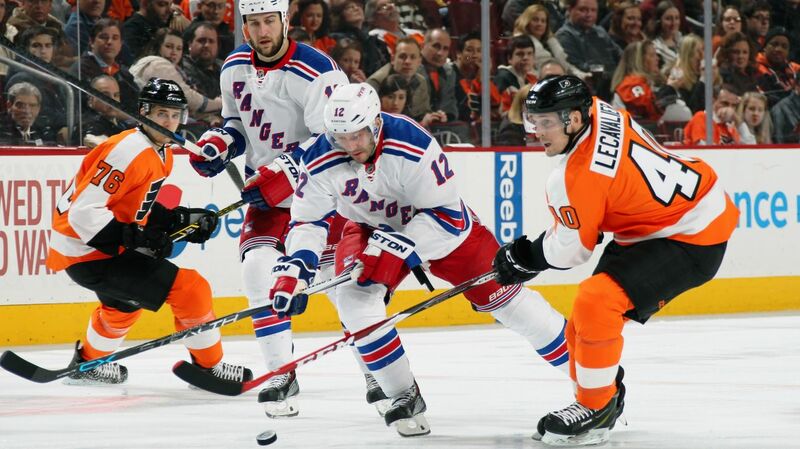 The Rangers did not have their best effort tonight, and looked flat at times. They didn’t capitalize on their advantages, dropping a winnable game against the flyers. The top two lines didn’t do all that much, and Vigneault gave a lot of time to Kevin Hayes’ line and Dominic Moore’s line, who played great tonight. The Rangers third line had another strong showing, outperforming the top two lines by a wide margin. Photo courtesy of Getty Images. Dan Boyle has had a bad season for the Rangers to put it lightly. He broke his hand in the first game, and struggled to regain his form when he came back. Just when he was picking up his play, he got the flu. He came back, started streaking again, and got the flu again. Nothing has gone his way, and he has turned into more of a defensive liability. He is really struggling, finishing with a -3 rating tonight. He really needs to pick up his game in order for the Rangers to have success. JT Miller had one of his best games of the season tonight. Miller scored the opening goal, ending a spree of bad luck for him in the last few games. Vigneault even stuck him out on the ice in late game situations alongside Derek Stepan and Martin St. Louis. As soon as he scored, he looked rejuvenated, playing with a ton of confidence and physicality. Let’s see this carry over to the next game. Yet again, the fourth line impressed me. 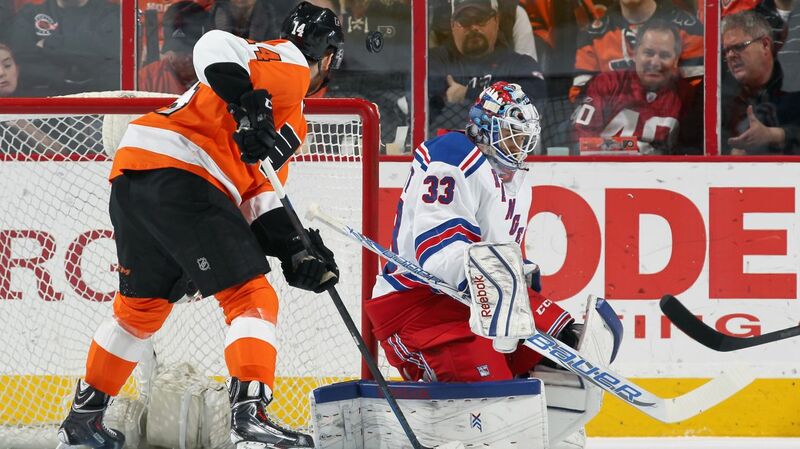 The bottom line combined for seven shots on goal, and their forechecking generated the Rangers first goal. Vigneault can finally rely on the Ivy League line to generate some offense, and they did it tonight. Good for John Moore scoring a goal. The Rangers have not been able to find a steady sixth defenseman, and John Moore has made two really great plays in the last two games. Hopefully this isn’t indicative to the situation at hand, but Mats Zuccarello wasn’t available for comment after the game. He finished with two shots on goal and a -3 rating. Mats Zuccarello wasn’t available for comments after the game following a rough performance. Does he believe that his time in New York is up? Photo courtesy of Getty Images. 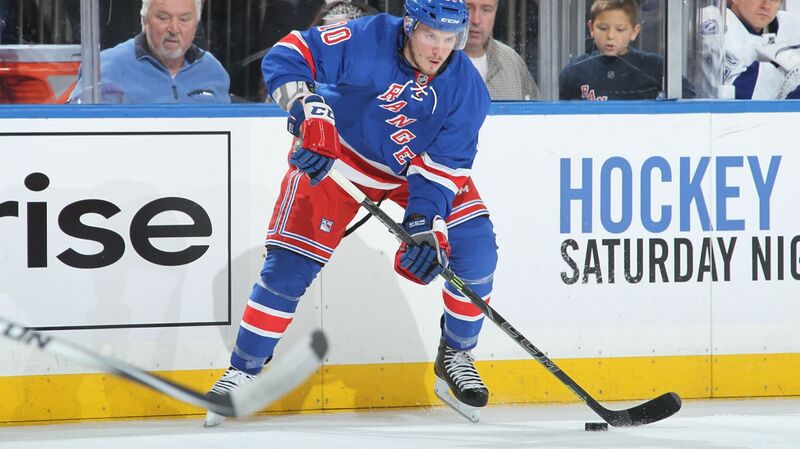 The Rangers next game will be on Monday in New York again, where they will take on the Nashville Predators. 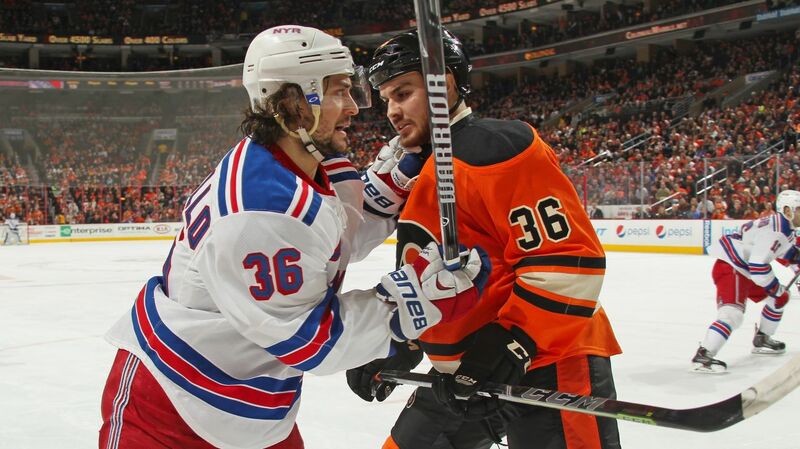 Posted on March 1, 2015, in Game Recaps and tagged Alain Vigneault, Cam Talbot, Carl Hagelin, Chris Kreider, Claude Giroux, Dan Boyle, Dan Girardi, Derek Stepan, Derick Brassard, Dominic Moore, Henrik Lundqvist, Jakub Voracek, Jesper Fast, John Moore, JT Miller, Kevin Hayes, Kevin Klein, King Henrik, Lee Stempniak, Mackenzie Skapski, Madison Square Garden, Marc Staal, Martin St. Louis, Mats Zuccarello, Matt Hunwick, MSG, MSL, New York Rangers, NHL, NHL 2014-2015 Season, NHL Trade deadline, NY Rangers, NYR, Philadelphia Flyers, Rangers, Rangers Nation, Rangerstown, Rick Nash, Ryan McDonagh, Skapski, Tanner Glass, The Ranger Zone, Zuccarello. NHL Trade Rumors. Bookmark the permalink. Leave a comment.